Jacob Saylors, 11, walks through the burned remains of his home in Paradise, California on November 18, 2018. The family lost a home in the same spot to a fire 10 years prior. Authorities in the western U.S. state of California were able to determine Sunday that nearly 300 more people are safe after the deadliest wildfire in the state's history swept through their town. But more than a week after the Camp Fire began in Paradise, nearly 1,000 people are still unaccounted for as search crews go through the remains of burned buildings and others try to contact those reported missing by friends and family. The official death toll rose to 77 people Sunday. The Butte County Sheriff's Office said that so far authorities have identified 67 of the dead. The fire itself is still burning, 65 percent contained as thousands of firefighters work to bring it under control. Fire officials said crews made progress Sunday in creating and reinforcing the containment lines they hope will eventually halt the fire's advance. They are due to get some help this week with several days of rain in the forecast for northern California. But while the shift in weather from the dry, hot conditions that allowed the blaze to spread so rapidly will help firefighters, it will also make the work of those searching for remains among ash more difficult. And with the fire leaving behind terrain stripped of vegetation, there is also a heightened risk of floods and mudslides. California's governor expressed optimism Sunday that U.S. President Donald Trump would support the state. Following Trump's visit to California the day before, Democratic governor Jerry Brown said in an interview with CBS' "Face the Nation" that the president has "got our back" and has pledged to continue to help. 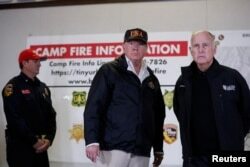 U.S. President Donald Trump and California Governor Jerry Brown participate during a briefing with State officials after visiting the charred wreckage of Skyway Villa Mobile Home and RV Park in Paradise, in Chico, California, Nov. 17, 2018. ​"The president not only has signed a presidential declaration giving California substantial funding, but he said and pledged very specifically to continue to help us, that he's got our back," Brown said. "And I thought that was a very positive thing." Brown also suggested in Sunday's interview that California's wildfires will make the most ardent of climate change skeptics believers in the coming years. Trump visited California Saturday to get a close-up look at the widespread damage that raging wildfires have inflicted on the state. "Nobody would have ever thought this could have happened," he said to reporters after walking through burned-out ruins in Paradise. "It's like total devastation." At least 10,000 homes have been destroyed. "I think people have to see this really to understand it." Trump said. Trump was accompanied on his visit by Paradise Mayor Jody Jones, California Governor Brown, Governor-elect Gavin Newsom, and Federal Emergency Management Agency head Brock Long. He pledged to the California officials the support of the federal government, saying, "We're all going to work together." He vowed also to work with environmental groups on better forest management and added, "Hopefully this is going to be the last of these because this was a really, really bad one." But when asked if the fire had changed his mind on climate change, Trump said, "No, no." He said he believes a lot of factors are to blame. The president also visited a local command center in Chico, California, and praised the firefighters and other first responders. "You folks have been incredible," he said, adding that those battling the flames are "fighting like hell." 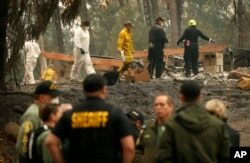 Investigators recover human remains at a home burned in the Camp Fire, Nov. 15, 2018, in Magalia, Calif.
Late Saturday afternoon, Trump landed in Southern California, where the Woolsey Fire has burned nearly 390 square kilometers. Fire officials say the blaze had been about 60 percent contained by Friday. Evacuated residents are returning to the area. En route from Northern to Southern California, Trump told reporters he had not discussed climate change with Governor Brown and Governor-elect Newsom, both of whom accompanied him on the flight. "We have different views," Trump said. "But maybe not as different as people think." On the same issue, Brown told reporters, "We'll let science determine this over a longer period of time. Right now we're collaborating on the most immediate response and that's very important."